You can celebrate with us by entering your creation following our Sketch and using a minimum of 1 die. Then join us with the blog hop to win other prizes!! My image is Swirly Bird from Milk Coffee and I colored it Copics. I used Stampendous Shabby Green Frantage around the edges. SU Bitty Banners are on the side for the sentiment. Spellbinders circles and scalloped circles for the image. The inside of the card is the same but I added a butterfly ribbon from my stash. I will have 2 cards to win as well as a little something extra! This blog hop expires on May 19, 2013. To Win prizes leave comments on each designers blog, follow the Blog Hop and then leave a link on the challenge blog, enter your creations at the LAST LINKY at the challenge blog. 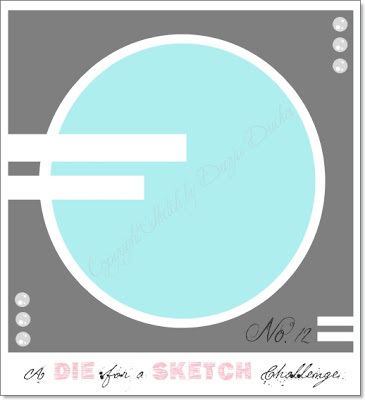 A Die For A Sketch Challenge Blog is having a DT call so please put DT next to your name on your creation entry. I hope you enjoy all our festivities this month at A Die For A Sketch and I wish you all luck in winning the prizes we have to offer. What a beautiful, colourful card - delicious! I can't remember if I commented on this or not... I started to and then got sidetracked with something else so if it is a duplicate, so sorry. I don't think I did but confusion is reigning! Anyway, I like this card. Such a fab image and I like how you've coloured it and those papers are fabulous! The Frantage is what distracted me. I've not heard of that before and I love the effect so I opened another window and started searching for it. Oh yeah... my mind is very clear now... hahahahhaha... Have a good one, my friend! This is gorgeous.. I just LOVE that image.. it is fantastic! And your coloring is amazing!!! Absolutely BEAUTIFUL!!!! Very pretty card Kelly - love all the colors and that gorgeous bird. You know me and birds!!!! Have you been reading!!!! An OUTSTANDING job coloring and showcasing that beautiful bird, Kelly! I love the frantage (did not know it comes in green) and the lovely coordinating flowers. Howdy Kelly! I see you've been busy creating more beauty here. Love the colors and that bird is gorgeous. I've never used the frontage yet. I'm behind. Anyway this is a real beauty inside and out. 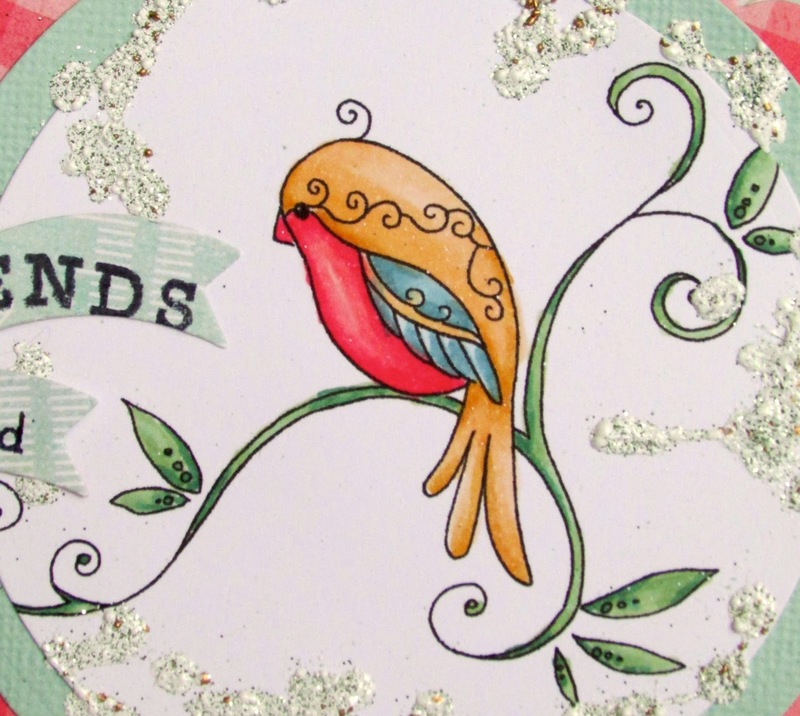 Hi Kelly Great card and I love the little birdie. The inside of your card is also beautiful. lovely card!! I like the colours and the bird!! Dear Kelly, your card is gorgeous, i love everything about it. The colors are bright and i love that you've used Frantage's Enamels, they are wonderful, right? Like the Die's you have used, the flowers, the butterfly...everything!!! Beautiful card Kelly. I love the DP's with their bright colors. Also the image of the bird is lovely and you did a fantastic job with the coloring. Also all the other details are amazing. What fun! Beautiful coloring and card designing Kelly! I need to check out this sketch challenge! TFS! Following the bloghop I came to visit your blog. And I found here a beautyful card. The image and colors are awesome. What a great card! Love the fun colours and it's a wonderful design! Your card is so pretty! I love the colors you used, perfect. Your card looks very colourfull and i just love it. Lovely papers you've used for your design. It just compliment the image! 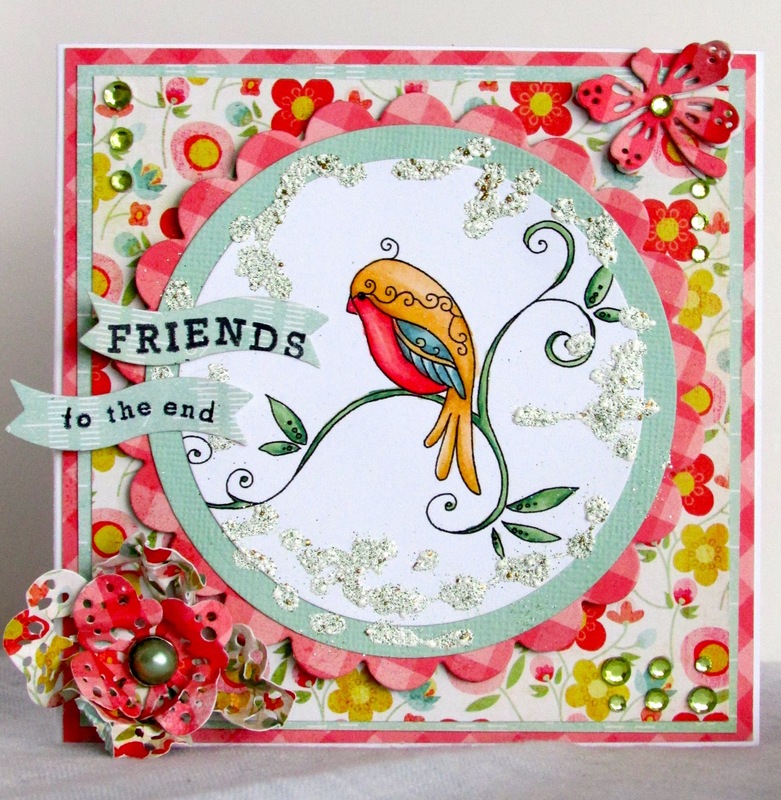 Absolutely gorgeous, love the bright colours and fab image! Enjoying the hop!